Divinity Designs, LLC Blog: Customer Card of the Day - "Lavendula"
Customer Card of the Day - "Lavendula"
Hello everyone! Please help give big congrats to Sarah aka "Lavendula" for creating this week's Customer Card of the Day! 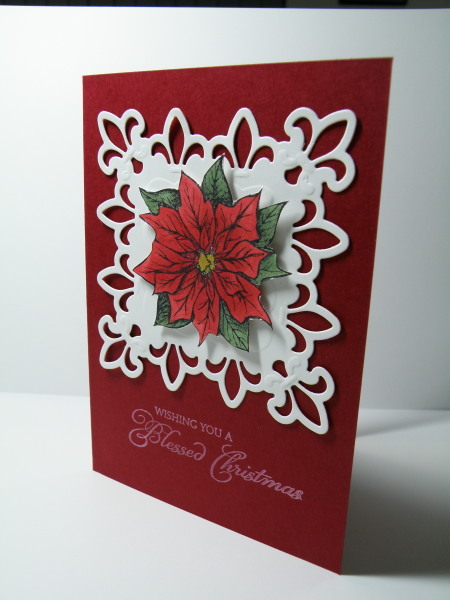 Check out the clean and elegant design.....the Spellbinder Fleur De Lis Pendant in white against the deep red cardstock, the beautifully colored and popped-up poinsettia from the "Blessed Christmas" set, and the sentiment stamped in white. Some would call this "clean and simple".....I call it simply gorgeous!!! Thanks for the creative inspiration, Sarah!!! I know you would love to see more of Sarah's outstanding work! Please give her lots of love over at her Splitcoast gallery, Lavendula! Lots of clean and simple beauties there for those of you (like me) who need some help in that area!! Congrats again, Sarah!!! Stay tuned as we revisit another oldie but goodie stamp set on Flashback Friday Favorites. Plus, you don't want to miss out on Saturday's Shining the Light Challenge....with yet another chance to win $ toward ODBD stamps AND you get to see our two new Challenge Team members, Silke and Pat, in action as well!!! One more thing before I sign off.....you still have another week to play in the Stamping in Time: Ring In The New Year Challenge and three more weeks to participate in the Let Your Light Shine scrapbooking challenge...good luck and Happy Stamping!!! Wow, clean and elegant for sure! Love the rich red with the white. Just stunning! Such a beautiful card to feature today. Congrats! If I needed another reason to get the Fleur de Lis Spellbinder this would clinch it. 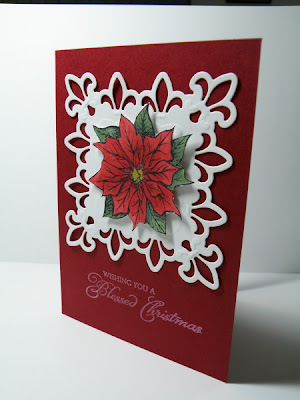 Beautiful card, love the design and the red is striking! Simply elegant! Less is definitely better!